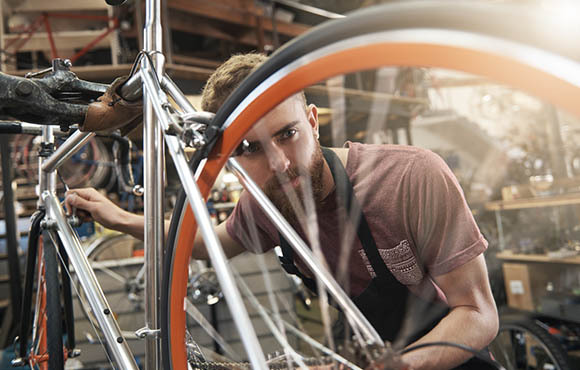 Single-speed (SS) training isn't just for dedicated single speed racers. All bike racers interested in improving their weaknesses in a fun and specific way can benefit from riding and training on a single speed. 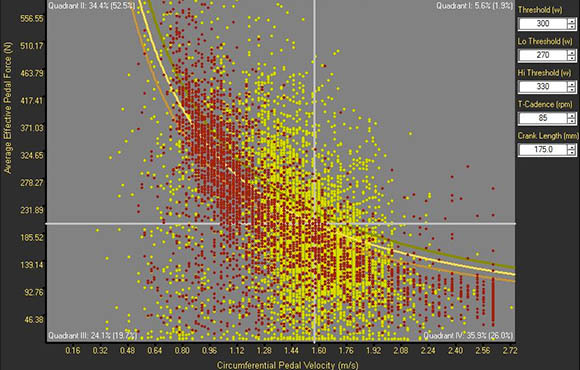 In the image below, you can view a Quadrant Analysis (QA) that was generated using Power-Tap data collected from one rider on both a geared mountain bike (in yellow), and a single-speed mountain bike (in red). This QA compares the physical demands of each mountain bike (MTB) ride. The rides were also similar in intensity (about IF .8). Each point within the QA plot shows the pedal force and pedal speed (think cadence—the vertical line corresponds to a cadence of 85). 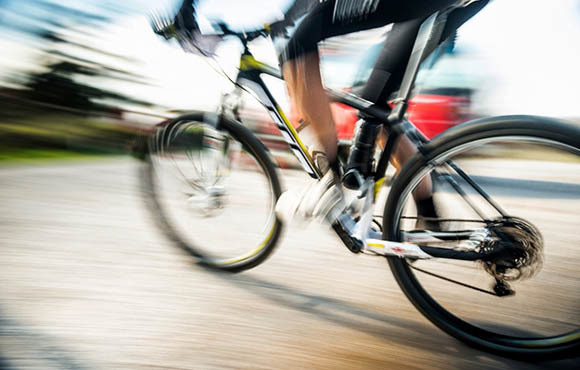 QA helps to identify the neuromuscular demands of a cycling genre. What's striking in this plot are the relative differences between SS MTB and geared MTB demands in terms of force and cadence. The iso-power lines illustrate that when pedal speed (cadence) gets very low, pedal forces must be very high to maintain power. Cyclists who use single speeds spend more time at higher and lower cadences than those who use gears. 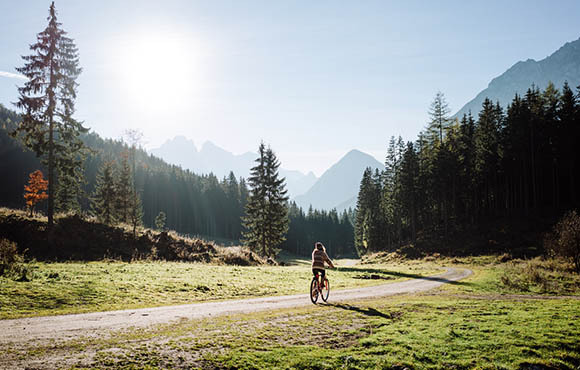 When a cyclist uses gears, he or she concentrates the majority of his or her pedaling around a small, preferred cadence range. Riding a single speed requires cadences in a huge range, from 20 revolutions per minute (rpm) to over 130 rpm. Because of this, riding a single-speed bike will put you out of your cadence comfort zone and stimulate new abilities. The force distribution differs significantly between both riding styles. 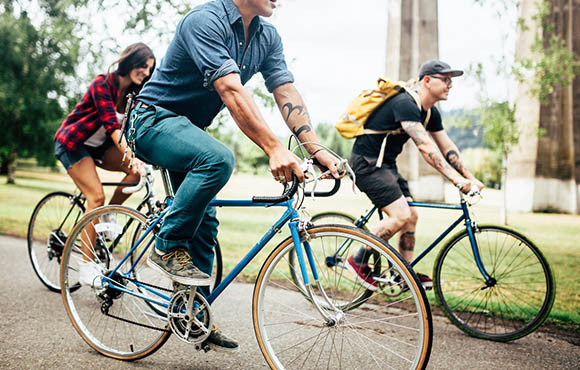 Single-speed cyclists spend more time pedaling at higher force levels and lower cadences (i.e., they do a lot of mashing and a lot of standing). It's a matter of physics—to maintain a given power output, if cadence decreases pedal force must increase, and as cadence gets really low pedal force must increase even more. To single speed successfully, you have to push a lot harder while pedaling slower. The cadence and force characteristics of a single speed are similar to other structured training drills such as spin-ups or force repeats. This makes a single-speed mountain bike a valuable training tool. The best part is, any hard-tail mountain bike can be converted into a single speed. Everybody has an old hard tail in the garage—right? Take off all the shifting stuff and put on a handful of cassette spacers, a chain tensioner and a single-speed cog. That's all you need, which makes tune ups a breeze. Another benefit of riding a single speed is that single speeds are the ultimate bad-weather training machines. Sloppy conditions are hell on drivetrains. Train on a single speed through mucky and wet conditions to save your bling race bike and components for race day. 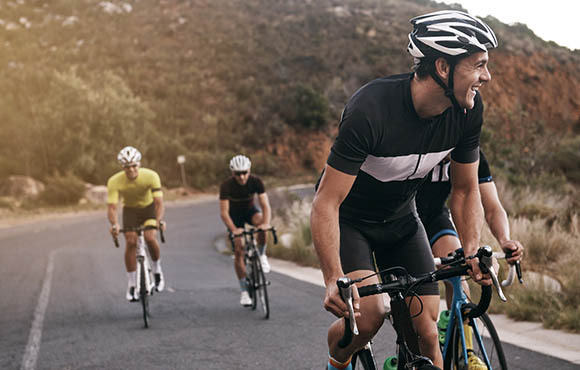 The following slides detail six specific ways that training on a single speed will make you faster and improve your overall cycling fitness. Low cadence/high force pedaling time improves low cadence power abilities, mimicking the goal of structured workouts such as force repeats or muscle-tension sessions. 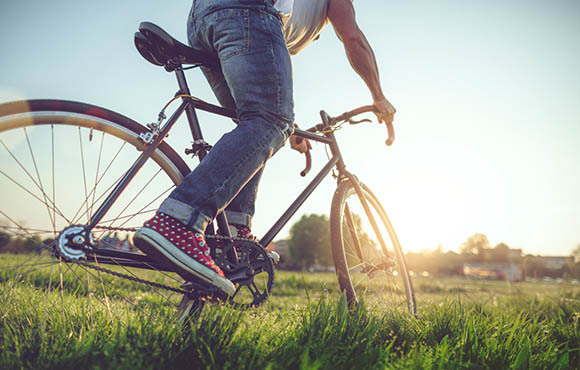 Increasing leg strength on the bike is more specific to bike racing than lifting weights in the gym, and it comes with the added benefits of cardio and skill development. Pedaling uphill, off-road and out of the saddle with high force and low cadence is a full-body effort. This type of training increases upper body and core strength in a riding specific position. High cadence pedaling time improves pedal stroke and replicates the goal of a skill workout, such as spin-ups. 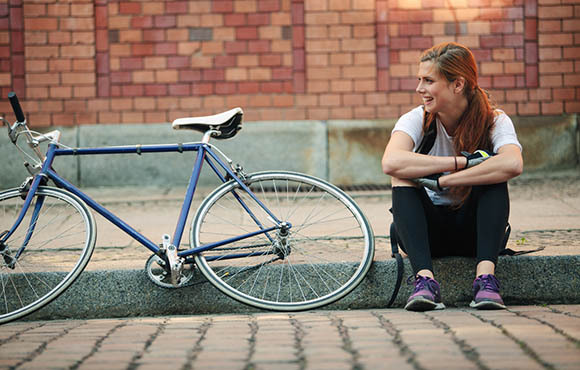 Single-speed riding enhances technical skill development with a simplified focus. 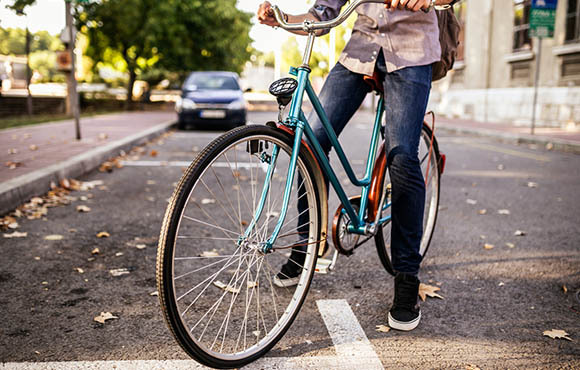 It requires no gear-choice, and there's no need to ease up on the pedals to plan a gearshift. This frees up all the time spent thinking about shifting and pedaling and let's you concentrate your efforts toward a technical challenge. Hammer straight into an obstacle and attack! Without a big ring to accelerate after momentum loss, the penalty of technical mistakes is magnified on a single speed. It teaches you to maintain speed in corners and traction while pedaling out of the saddle. 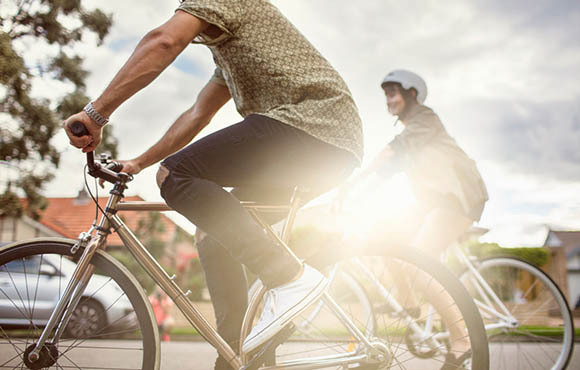 You'll become a more efficient cyclist and increase your bike-handling technique to maximize efficiency and conserve momentum. Trail momentum killers such as soft dirt, holes, bumps and rocks become larger obstacles with a single speed since there's no big ring to power it out with. The penalty of losing momentum is a strong motivator to ride the fastest line on the trail. 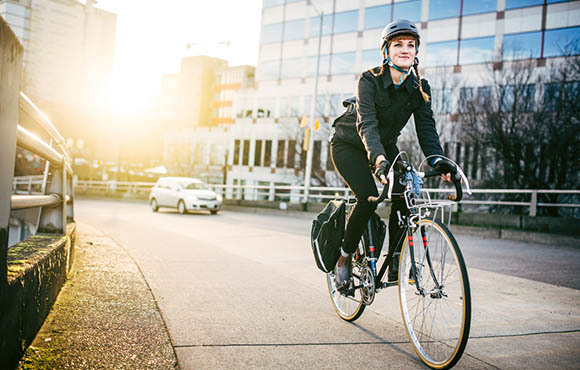 You will learn how to keep your bike moving with less power, which will make you a smoother, more efficient cyclist. The new challenge of single-speed cycling will add variety, simplicity in bad weather and provide huge training gains. All you need to do is get out and give it a shot. Should You Train at a Non-Optimal Cadence?